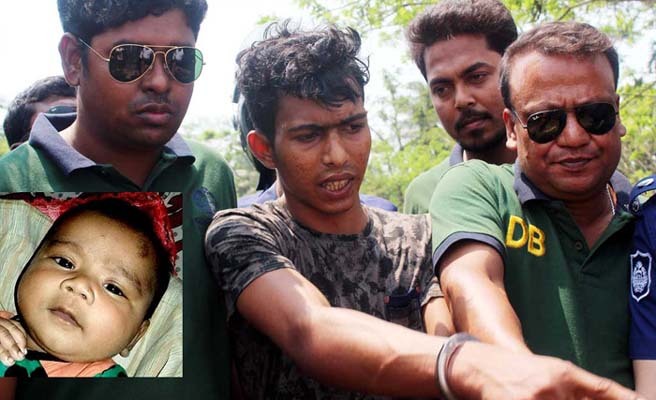 Police recovered the body of a 2-and-half-month baby boy who was kidnapped for ransom on March 11, from inside a toilet of a fish enclosure at Bisharighat village in Morrelganj upazila on Sunday. The victim was identified as Abdullah, son of Sirajul Islam Sohag Talukder of the area, reports UNB. Police arrested the mastermind of the kidnaping bid Hridoy alias Rahat Chaprashi, 22, from Dhaka over an abduction case on Saturday. After gleaning information from him, police recovered the infant's body from the toilet on Sunday noon, said Pankaj Sharan, Superintendent of Bagerhat Police. According to case statement, on the early hours of March 11, the criminals entered Shohag's house cutting grill of the window while the child was sleeping with his parents. When its mother woke up around 4:30am, she did not find her child and found the window open. A cell phone also could not be found. Later, victim's father Shohag filed an abduction case with Morrelganj Police Station. Police on Wednesday last arrested Hridoy's mother Nasima Beg, 52, sister Abir Begum, 14, and brothers Mahiuddin Chaprashi, 35, Faijul Chaprashi, 25, Deloar Hossain, 30, and Rubel in this connection. After getting information from the arrestees, police arrested Hridoy from Dhaka's Kallyanpur area.